Below represented organizations strongly condem the physical and psychological violence against Marina Khachatryan, a member of “Yerkir Tsirani” party in Yerevan community council by the members of Republican Party during the Yerevan Community seeting on February 13 of 2018. The public display of the force one more time proves and highlights the propoganding and disseminating tendencies of the current impunity, as well as the culture of resovling the violation issues by the ruling party’s administration. Such conduct by the high-ranking official displayed in professional platform neutralizes the government imitative efforts that democratic reforms are being implemented in the country. The actions of the Republican Party Members one more time show the role of a woman and the viscious practice of violence against her. The Human Rights Defender to immediately institute a proceeding and on the sanctioning demand apply to the RA Prosecutor General’s Office and RA Special Investigation Service. At the same time, the Organizations expresse their radinnes for the protection of Marine Khachatryan’s rights and interests. 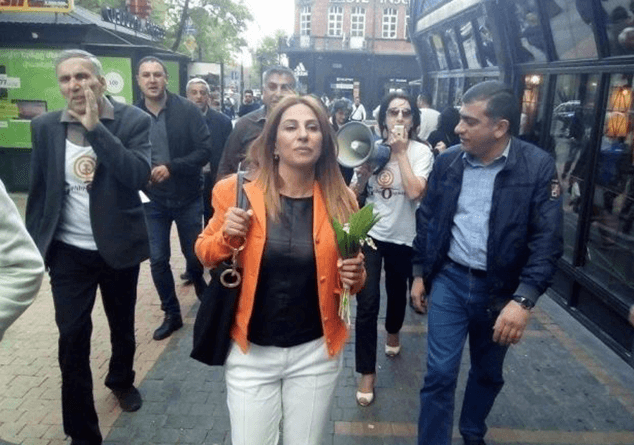 It should be noted, that the members of “Yerkir Tsirani” party brough the bottles of sewage water from Nubarashen into the hall and attempted to approach the latter to Mayor Taron Margaryan. The activities of “Yerkir Tsirani” were targeted towards making the issues regarding the stench in Nubarashen community for a long period of time and the current problems visible and tangible. The video is available with the following link http://lurer.com/?p=278558&l=am.